NEW YORK (AP) — Ann Sui opened a grand bazaar as she dreamt of an unspoiled paradise at New York Fashion Week. The vibe, she said, was wanderlust, an escapist fantasy. Set designer Jerry Schwartz created her shopping experience for guests, including filmmaker Francis Ford Coppola, his filmmaker daughter Sofia Coppola and Naomi Campbell. For her spring collection, Sui chose bright colors and bold patterns in silk dresses, shorts and loose-fitting pantsuits. Many looks had matching turbans or floppy hats. Models walked in bright colored sneakers and sandals with lace socks. The final look, worn by Gigi Hadid, was a gold glittery V-neck dress that was sheer from the waist to ankle. “I was inspired by the way Tony Duquette did the sets in ‘Kismet,’ where he kept everything very neutral and gold, which is what we did with our set. And what popped were the color clothing and what people were wearing or objects they were finding in the market,” Sui said. Shapes were sporty in luxe metallic brocades. Glittery party dresses were paired with the aforementioned anklets and sneakers. She made use of Jacquard fisherman vests, oversized embellished biker jackets, pinup girl bathing suits, satin cowboy shirts and Polynesian jumpsuits. Lots of looks were trimmed in fish scale sequins and ombre fringe. 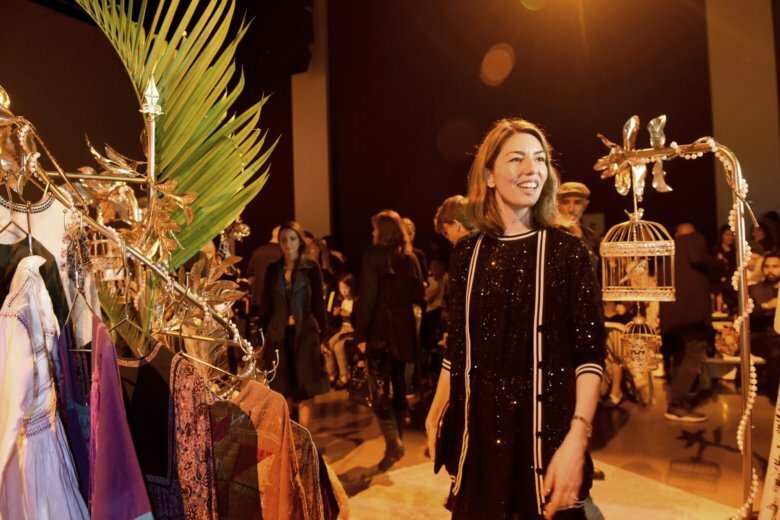 Sofia Coppola made a purchase, to be picked up after the show with other buyers.